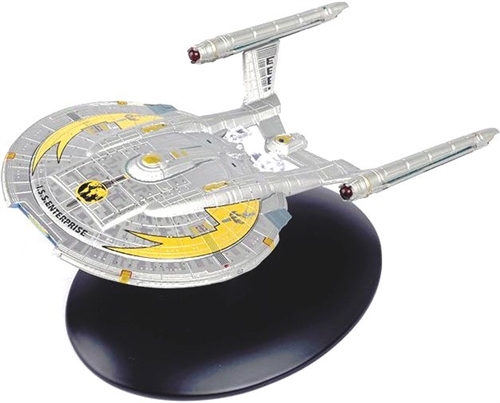 The Eaglemoss starship range is a brand new collection of model STAR TREK starships includes all the most significant vessels from all five STAR TREK TV series, including dozens of ships that have never been produced before. Each ship has been painstakingly recreated in die-cast metal and high quality ABS and then painted by hand. The "mirror universe" is an informal name for a parallel universe first recorded as visited by James T. Kirk and several officers from the USS Enterprise in 2267. This parallel universe coexists with the prime universe on another dimensional plane. The mirror universe was so named because many people and places seemed to be opposites of their characteristics in the prime universe, with numerous good aspects now evil and vice versa, thus "mirror"-like. The ISS Defiant (NX-74205) was a Terran Defiant-class warship that was in service to the Terran Resistance Forces in the latter half of the 24th century. The Defiant was constructed and launched in 2372 by the Rebellion at Terok Nor, in orbit of the planet Bajor. The ISS Enterprise (NCC-1701) was a Terran Constitution-class battle cruiser that was in service to Starfleet in the mid-23rd century. Sometime prior to 2267, James T. Kirk took command of the Enterprise through the assassination of Captain Christopher Pike.